Tortillas are extremely popular in the United States and a staple food in many homes. They serve as a base for a wide variety of ingredients, including vegetables, legumes, and protein sources. Tortillas are a starch, typically made from flour or corn. Tortillas can also be made using ingredients such as rice and whole grain flour. The ingredients cannot only affect the nutrition composition, but also the texture of the product. For example, corn tortillas are much harder then flour tortillas. Historically, corn tortillas were a staple food in the New World and were used well before flour tortillas came into existence. Coincidentally, diabetes became an epidemic in a short time as flour tortillas replaced the corn tortilla as a staple food after wheat flour was introduced to the New World by Spain. Typically, corn tortillas are nutritionally superior to flour tortillas. They tend to have more fiber, less fat, and fewer calories than white flour tortillas. In addition to corn tortillas, you can purchase alternative, healthier types of tortillas, including whole-grain tortillas, which contain more fiber, vitamins, minerals, and protein for fewer calories. This particular tortilla is moderate in calories and carbohydrate, about the equivalent to two slices of bread. It's a good source of protein, too, containing 4g in one wrap. But, it is sub-par in the fiber department. It's best to choose tortillas that are a good source of fiber, at least 3 g per serving. In addition, look at the ingredient list. Many flour tortillas are made with hydrogenated trans fat and saturated fats, such as vegetable shortening or lard. Alternatively, corn tortillas and whole grain tortillas contain minimal fat. Depending on the size and type of tortilla you are choosing, tortillas can be moderate in calories and serve as a good source of protein, fiber, b-vitamins, and iron. Whole grains are a good substitute for processed, refined grains such as white bread, white rice, and white pasta, and, when used in place of processed grains, can help to improve your blood sugars and keep you full. Corn and rice tortillas can be part of a gluten-free diet. How can you warm corn tortillas? Contrary to traditional home-made tortillas which are soft and puffy, corn tortillas from the market are often brittle. To moisten them, try warming them in the microwave or on the stove top. Wet your hands and lightly moisten the tortilla with damp hands. Warm it over the burner, flipping it every few seconds to prevent burning. Or, damp a paper towel and wrap the tortilla inside, placing it on a microwave-safe dish and warm it in the microwave for about 10-15 seconds. Are vegetable tortillas, like spinach, healthy? Today there are so many different varieties of wraps. Vegetable wraps, such as spinach or tomato are simply tortillas made with white flour that have had seasonings such as tomato powder to give it its vegetable-like coloring and flavor. Always remember to read the ingredient list and check the labels before purchasing. If the first ingredient says "enriched bleached flour," that means the primary ingredient in the food is white flour. Foods made with white flour tend to increase blood sugars more quickly than others and are considered to be refined carbohydrates. When purchasing tortillas, look for varieties that contain about 150 calories per serving (about 8 inches), this is roughly the equivalent of two slices of bread. Check the ingredient list and look for those that say, "whole" as the first ingredient. For example, whole corn, whole wheat, means that the food is 100% whole grain and has not been stripped of its vitamins, minerals , and fiber. Whole grains are grains that are made up of all parts of the grain - the bran (fiber-rich outer layer), the endosperm (middle), and the germ (the nutrient-rich inner part). They generally have a lower glycemic index, which means they raise blood sugars at a slower pace and they contain more heart-healthy, filling fiber. Place whole grain tortillas in the refrigerator to maintain optimal freshness. Discard on the expiration date. Tortillas can be used to make anything and everything. They are simple, cost-effective and filling. Whether your a vegetarian or a meat eater, tortillas can be used to wrap or roll your food. 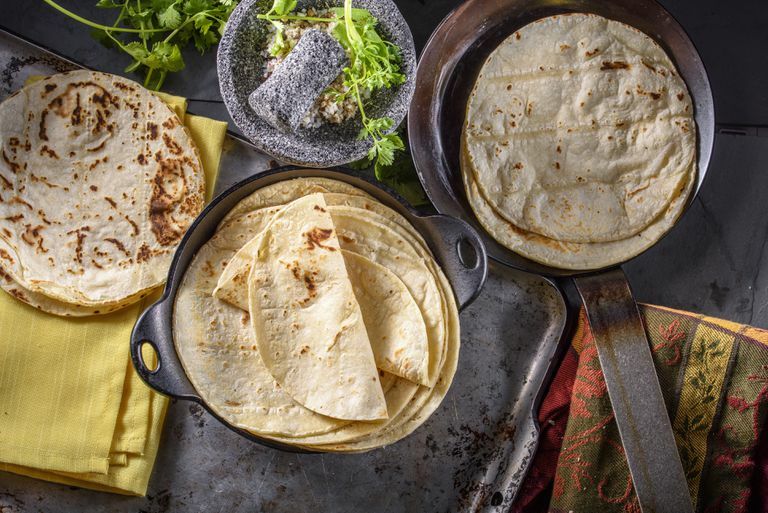 Use tortillas to make quesadillas, tacos, fajitas, wraps, and roll-ups. Add lean protein, such as beans, eggs, tuna, turkey, fish, and healthy fat such as avocado, hummus or oil-based dressing for a fiber-rich, protein-packed, heart-healthy meal. Get cooking today and try these recipes for black beans and greens pinwheels, pork tostadas, or fish tacos.